trickster allows to run the following kind of attack. Starting with a given correctly classified example, apply a sequence of semantics-preserving transformations to it until the changed version of the example causes a missclassification error. Ideally, the cost of these transformations must be kept to a minimum. The capabilities of the adversary, including the inherent constraints of the domain, can be formalized as a transformation graph . Every example in the domain is a node in the graph, and its direct descendants are some atomic transformations. Other transformations are sequences of atomic transformations, so they are paths in the graph. Each transformation can have an associated cost, representing how hard it is for the adversary to perform it. Running an attack is then equal to graph search: traversing this transformation graph until a transformed example that flips the classifier decision is found. 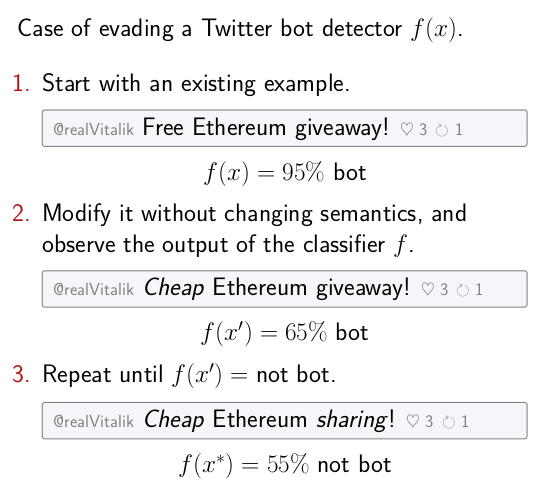 This will show how to run a basic evasion attack for a toy Twitter bot detector. Let’s use a different feature space for a Twitter bot detector. Each example will represent an account, and contain two features: number of tweets, and the number of likes of the account’s tweets. The graph is defined using an expand_fn function. Given an example (a node in the graph), it returns its atomic transformations (direct descendants in the graph) and their corresponding costs. One possible way to define atomic transformations for numeric features like the one used in the current example is increments and decrements. Each transformation will either increment or decrement one of the features. It’s easy to see that other transformations that change the integer values are compositions of these. In this instantation of the expand_fn, all changes have cost of one, except increasing number of likes to own tweets. That one is more costly, since it requires more work on the adversary’s side. Any other cost model is also possible. Let’s first define a toy classifier. The procedure finds a sequence of transformation that flips the decision of the classifier while incurring the minimal possible cost to the adversary. If everything was defined correctly, the adversary can now enact these changes to evade the detection. In this case, the adversary needs to delete some tweets from an existing account. This adversarial example is provably minimal, at the cost of extensive traversal of the transformation graph. Next sections describe how to do better. The search can be sped up using heuristics. This section is coming up. For some settings, one can find provably minimal examples even when using heuristics. This section is coming up. © Copyright 2018 by Bogdan Kulynych (EPFL SPRING Lab) Revision 070a8ea8.